TIGL introduces the most efficient 5 pass SHOLA - V heater to minimise the TEA drying cost. Shola-V is a cellular multitubular header specially designed for the Tea industry. The salient features of this heater are the double vertical rows of tube on either side of the grate which aids in either 3 pass or 5 pass of the flue gas. These heaters can be fired with either coal, leco, firewood, gas, or oil. Since its introduction, these heaters have found wide acceptance in factories large and small not only in India, but also in other Tea producing countries like Bangladesh, Kenya, Tanzania, Indonesia, Sri Lanka, Uganda, Malawi, Malaysia. In the Shola - V heater, hot flue gases drawn by an induced draught created over the grate by the ID Fan & Chimney pass through 2 vertical rows of Tube- bundles on either side of the grate and over the cast surfaces. Ambient fresh air drawn from the sides, back and top by the dryer fan, picks up heat from the heated surfaces and enters the drying chamber. The principle of both 3 pass and 5 pass is the same except that in 5 pass hot air is made to pass five times in the tube banks as against 3 times in the 3 pass. So heat transfer area is increased by more then 1.5 times & this improves the heater efficiency. Tube banks : Shola-V heaters are fitted with tube banks instead of individual tubes. Each tube banks consists of 5 tubes. The tube banks are grooved at each joint to fit asbestos rope packing for better sealing. The number of tube banks vary according to the size of the heater. For better heat transfer, the inner tubes are made of C.I. And the outer tubes are made of M.S. Foundation : The heater is erected on a firm and rigid concrete base. A concrete raft of 9’’ thick on solid earth is sufficient and no excavation is required. The heater is mounted on the concrete raft. Draft System : Shola-V heaters are designed to handle both Induced and Forced air draughts. For maximum efficiency the fans are specially designed with aerofoil impeller blades which deliver the required quantum of hot air with low power consumption. Inlet dampers are provided in the fan for better air control. Mechanical Stoking (optional) : Shola-V heaters can be conveniently fitted with mechanical stokers for uniform feeding of coal. This helps to maintain steady temperature as well as reduces coal consumption. Easy Installation : Entire Shola-V heater arch bars, tube banks, front plate, back plate, smoke box, side plates etc. Are made in parts so that handling is easy. All these parts are designed in such a way that they can be bolted together with asbestos tape sealing, so that installation can be done within a short time. Heat Transfer : Shola-V heaters are designed with higher heat transfer area and flue gases pass 5 times or 3 times before escaping into the atmosphere . This improves the efficiency of the heater . Moreover, since the flue gases pass through the tubes instead of over them, the tubes can be cleaned and maintained for better heat transfer. Materials : All castings are of superior quality and they are property cleaned & fettled before assembly. 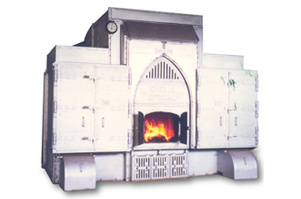 Special Graded heat resistant casting are used where heater has to cope with higher temperature, i.e. when LECO is fired or while using high temperatures. In 5-pass heaters the outer tube banks are made of special M.S tubes for better heat transfer. Heat Insulation : The entire inner surface of front plate and retaining bolts are insulated with special heat resistant compound. The angle cleats which are welded to the fan suction ducts are insulated with special lagging compound for better insulation. Multiple Models : Shola-V heaters are available in different sizes with both 3 pass & 5 pass. The biggest model Shola-V Jumbo produces usable heat of 20.6 lacs Kcal/hr. Better Heat Transfer : Shola-V heaters are specially designed for better heat transfer. The efficiency varies from 55-65% depending on model. Low Power & Coal Consumption : Due to better heat transfer the coal consumption per kg of made tea is less than 0.6 kg and power is also less by 25% in the 5-pass heaters, under normal conditional of use. Better Retention Of Heat : Shola-V heaters are constructed with better and high quality heat resistant materials, so heat loss is very minimal. Long Life Of Castings : All parts exposed to direct heat are made of special superior casting, so they last much longer. All castings except tube banks and arch bars are guaranteed for 5 years. No Maintenance : Since there are no moving parts, maintenance is very minimal expect cleaning of tube banks. Easy & Quick Installation : No excavations and no foundation bolts are required, since there are no moving parts. Moreover, the machine is supplied in dismantled condition for ease installation and handling. Versatile : Shola-V heaters can be coupled with any type of dryer.